Driving speeds in some of the UK’s major cities has fallen by up to 20% over the last year, as traffic volumes rise. The study by In-car Cleverness analysed nearly 400,000 journeys over the same three-month period in 2016 and 2017 and found London the average speed within a mile of the city centre dropped 1.22mph from an average of 6.35mph in 2016 to just 5.13mph in 2017 – a fall of 19%. Edinburgh and Manchester are also among the slowest cities to drive in. Average speeds within a mile of the Manchester city centre fell to just 6.57mph in 2017 – down 1.57mph from 8.14 in 2016 (a fall of 19%) while Edinburgh was down 0.25mph from 6.89 to 6.64mph. And in Glasgow, speeds fell by 1.74mph year to year, from 8.56 to 6.82 – a drop of 20%. 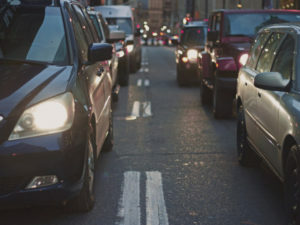 The most recent statistics from the Department for Transport (DfT) estimated that 68% of people are driving as part of their commute, meaning that millions of motorists around the UK’s busiest cities could be losing significant time otherwise spent at home or work. Latest Department for Transport (DoT) data shows that between April 2016 and March 2017, traffic volumes rose 1.7%, reaching a new record high of 324.3 billion miles. Paul O’Dowd, Head of Sales at In-car Cleverness, commented: “The figures paint a stark picture of how everyday commuters, drivers and even businesses are struggling to get around or operate in some of the biggest hubs in the UK. “Traffic management technology is becoming readily-available to drivers and businesses who are being robbed of time and money, the technology can help avoid these costly traffic jams and save time.”For more of the latest industry news, click here.